The Bonsai delivers up to a 6:1 conservation ratio which increases the amount of time a cylinder will last without compromising its clinical efficacy. A larger amount of oxygen can be used per cylinder, performing at a lower PSI, which equates to less wasted gas and longer periods of ambulation. The lightweight, compact design also makes it easy to take along with you. 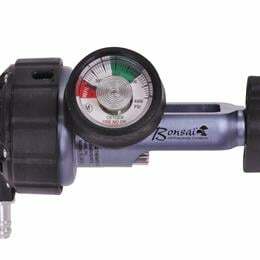 The Bonsai has a 4000 PSI gauge which means it can even be used on 3000 PSI cylinders. Another important feature of the Bonsai is that it uses uniform pulse technology which means you get the same bolus (dose) size for each breath, whether you are at rest or active, accommodating rapid breath rates up to 40 breaths per minute. Other conservers with minute volume technology may cause someone at rest to get more oxygen than they need and upon exertion they may not get enough oxygen. With the Bonsai you will get the oxygen you need, when you need it. It is also a very sensitive conserver, providing a bolus (dose) of oxygen in the first half of the inspiratory cycle. This ensures more oxygen reaches the patient and helps to avoid desaturation while maintaining saturation levels at 90% or greater. The Bonsai is quiet, providing inconspicuous operation (i.e. at meetings, at places of worship, etc.). The two additional settings, 6.0 and 7.0 on the Bonsai, provide the ability for clinicians to treat a wider range of patients. Highest savings ratio available on any pneumatic conserver. Delivers up to a 6:1 savings ratio. Senses a breath/delivers oxygen in the first half of the inspiratory cycle. Delivers a uniform oxygen pulse from 14-40 breaths per minute. Easy to operate single selector knob. Light weight, quiet operation, compact design. Fits easily in virtually any carry bag. Liter flow increments: 1, 2, 3, 4, 5, 6, 7 PLUS CF preset @ 2 LPM. Operating pressure range: 200-3000 PSI.